I’ve been doing more cooking that writing lately, the holidays will do that to you. So I’ve got several recipes to post. While I would prefer to write something witty and special for each of them, I’d rather get them up before next Christmas. The recipes will just have to speak for themselves. Dry pork with paper towels and season with salt and pepper. Tie the tenderloins together with kitchen string for easier handling. Heat an oven safe frying pan or grill pan over medium heat and lightly coat with vegetable oil. Add pork and sear on all sides. Remove from heat and spread apricot jam over the top of the pork with a spoon. Cook for 30 to 45 minutes or until the pork registers 160 degrees on an instant read thermometer. Tent loosely with foil and let the pork rest for 10 minutes before slicing. BAH Note: If you like things spicy, go ahead and chop up some of the chipotle peppers and add to the mashed potatoes. Peel the sweet potatoes and cut into large chunks. Fill a large sauce pan with about an inch of water, place a steamer basket in the pot, and fill the basket with the sweet potatoes. Cover, bring the water to a good simmer over medium heat, and cook for 30 to 40 minutes until the potatoes are fork tender. Carefully remove the steamer basket and mash the potatoes with a ricer. Add the butter, honey, and adobo sauce and stir to combine. Season to taste with salt. Seriously, anytime you need help taste testing your food…we can stay on call! I’m always looking for people willing to taste test. The Mistah has a limited range of reaction to recipes so it would be nice to get some feedback that’s a little more informative than “tasty”. This past weekend I did a variation on the pork where I used hoisin sauce, 5 spice powder, and agave nectar. 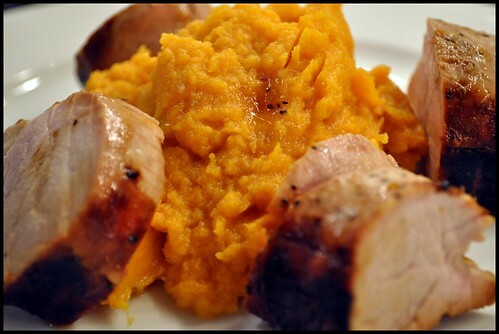 Same method, same mashed sweet potatoes. The hoisin doesn’t glaze as well as preserves do but the taste is very comforting. I want those mashed sweet potatoes! NOW!! I’ve seriously been starving all day. Beth, those mashed sweet potatoes are favorites at our house. If you want to leave work and go to my house, I’ve got some leftover in the fridge. Do you think the cat could manage to turn off the alarm and open the door for you? We love our pork tenderloin over here–I’m definitely going to be trying this! Promise me you’ll make the mashed sweet potatoes too because these two go great together. If your cat is anything like our two, it would just look annoyed to be woken up in the middle of the day, and would be no help at all! Ihave actually made something akin to this pork loin and it is wonderful! the potatoes sound ultra also ( here are those chiles in adobo again) so I just may have to break out the can in my pantry and take a shot at these. Minnie ( the cat) says she will open the door as soon as her opposable thumb arrives. It is on backorder! Emily, definitely dig out that can of chiles in adobo and give these mashed ‘taters a try.